The high mountain sagebrush steppe located just behind Jeremy Ranch Elementary School is known as the Rasmussen Open Space. 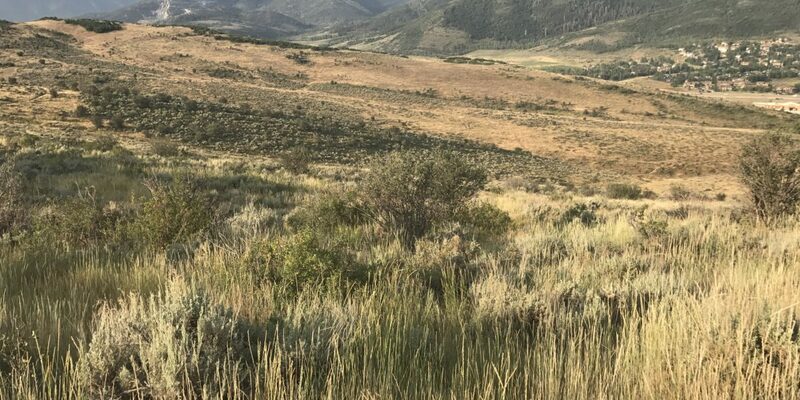 This open range of rolling sagebrush, oak woodlands and wildflowers affords spectacular views of the Wasatch Back and is home to the system of directional trails called Bob’s Basin. Moose, deer, elk, and even cougars have been spotted in this area. Rasmussen is full of sun and is one of the early properties to dry out in the spring. The yellow wildflowers are spectacular in late June, so be sure to get out there and check them out. Primary access is from the East Canyon Creek Trailhead behind Jeremy Ranch Elementary School or the Bad Apple Trailhead behind Burt Brothers on Rasmussen Road. Bob’s Basin has quick climbs and fun flowing descents that are conducive to several laps. Drop down one of the trails in Bob’s Basin, such as The Drop Out or Ant Farm, on your way to or from Flying Dog to enjoy trails with a “free-ride flair” including bermed turns, jumps, and rollers. This area also provides access to the trails in the Glenwild and Flying Dog trail network. Several trails in Bob’s Basin are directional downhill flow trails, please be mindful of signage.